A collaboration between mp3 creator, Fraunhofer IIS, and plug-in designer/manufacturer Sonnox, has resulted in a new plug-in that they say is "set to revolutionize the way audio is mastered for online distribution". 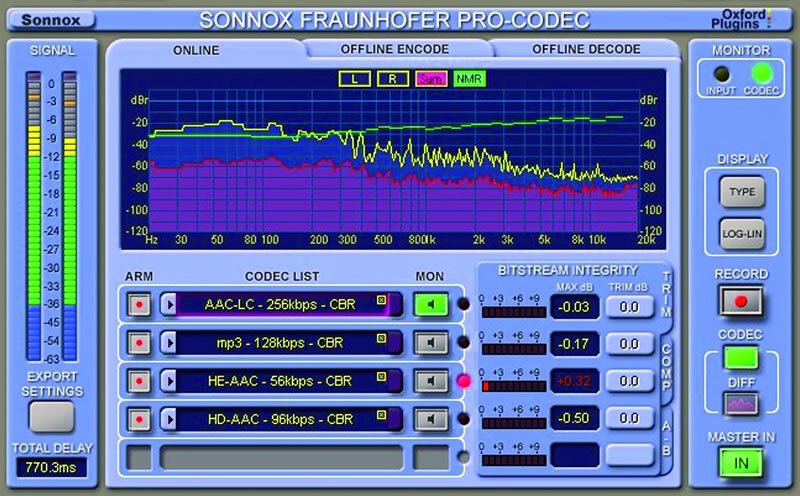 The new Sonnox Fraunhofer Pro-Codec plug-in makes it possible for the first time to precisely audition codecs in real time. This breaks away from the current time-consuming cycle of having to encode the mix to mp3/AAC, preview it, tweak it and then go back and re-render. The entire process is accomplished 'on the fly,' and frees the engineer to focus on producing a compensated, optimized mix. The Pro-Codec plug-in enables mix and mastering engineers to audition up to five codecs in real time within a DAW environment, produce an optimized mix and batch encode to multiple formats simultaneously. All major codecs, including mp3, mp3 Surround, AAC-LC and HE-AAC are supported, as are lossless codecs such as mp3 HD and HD-AAC. Sonnox has developed an intuitive FFT display to illustrate the input signal, output difference signal and a unique graphical indication of the audibility of codec-induced noise. Bit-stream integrity meters reveal potential decode overloads. Instant A-B auditioning enables engineers to glitchlessly switch between codecs. A 'blind listening mode' (ABX) augments codec comparisons. Harald Popp, Head of the Multimedia Realtime Systems Department at Fraunhofer IIS, comments, "With the growing importance of online music distribution we have seen a strong need for mastering engineers to prepare mixes for download acquisition. Our search for the perfect partner to solve this issue led us to Sonnox and their uniquely successful plug-ins. The opportunity to collaborate with them on this truly market-driven product has been an extremely gratifying experience." "Fraunhofer's mp3 and AAC technology has revolutionized the audio industry," adds Sonnox Managing Director Rod Densham. "We are excited to be collaborating with them in this unique new mastering solution, which we believe will change the way engineers prepare final mixes or masters for online distribution." The Pro-Codec plug-in is compatible with all popular DAWs - Pro Tools, Logic, Cubase, Nuendo, Sonar, Sequoia and Wavelab. Both Mac OS X and Windows are supported. 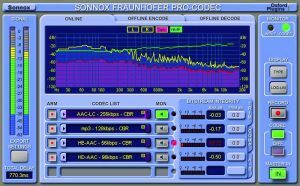 The Sonnox Fraunhofer Pro-Codec plug-in was introduced at The NAMM Show in Anaheim California and will be available shortly at a price of $499.